Tanish of MsTanish1 on youtube is the featured case study. She is one of those long term naturals having had her natural hair for over 10 years. She is one to play around with weaves and wigs as well as rocking her own natural hair. I do find it amazing that she manages to fit all of her natural hair under a weave...the great part though is that if you want to know how she does, there is a video for it! She is definitely generous when it comes to sharing information and you will find answers to her routine and methods in videos or within the descriptions attached to the videos. Styling for Length Retention Protective style - generally twisted styles worn for about 4 - 5 weeks at a time. Moisturising Routine Moisturises hair in twists by applying a small amount of water, leave in conditioner and oil. This is done 1-2 times a week guided by how dry hair feels. Detangling Method Dry finger detangling and conditioner combing with a wide tooth comb. Embedding is disabled on the video I really wanted to show you but here is a link to it. It is one of her most detailed and helpful videos on her method of maintaining her 4c hair. 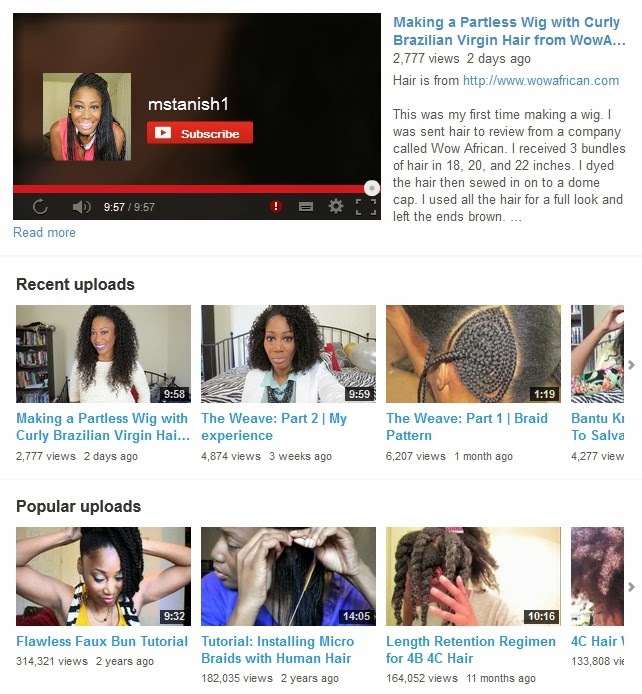 As a substitute, here is a video of her styling her loose two strand twists. Love her, she is great and definitely one of my YT favs!!!! I really like the 4c natural hair case studies. I've never hear of her before. Thank you for sharing.